Benefit from our deep MediaWiki knowledge, with tailored MediaWiki training courses. From user and content administration to fostering a community on your MediaWiki website, our training sessions are customised to your needs. MediaWiki is an open-source software that allows ‘wiki’ websites such as Wikipedia, the free online encyclopaedia, to be created. More specifically, a wiki allows a community to edit content alongside each other, providing a history of changes to the content and dealing with conflicts. MediaWiki has been created with the aim of being as simple as possible to use, though its complexity can initially be baffling to new users to it. That’s exactly where Peacock Carter’s MediaWiki training courses can help you or your organisation. 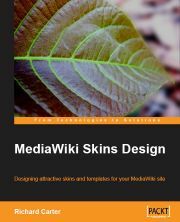 Whilst many organisations offer MediaWiki training courses, you truly benefit from our deep MediaWiki knowledge; training courses are run by Richard Carter, author of the book MediaWiki Skins Design, and a sought-after MediaWiki consultant. An overview of wikis and what they can do. What is a template in MediaWiki? Protecting a page from editing. …and as much detail as you want to know! We’re happy to deliver the MediaWiki course(s) on your premises, or at our office if you wish to come and visit Newcastle upon Tyne and the North East of England. We can deliver courses anywhere in the UK including London, Manchester, Birmingham and Edinburgh, and are able to travel abroad if required. If you are interested in our MediaWiki training courses, contact Richard Carter on 0191 499 8456 (+44(0)191 423 6208 from abroad), or email us at hello@peacockcarter.com.